Hello dear foodies! Isn’t the weather out there getting lovelier with every passing day? 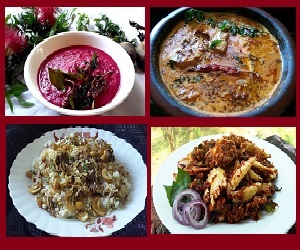 Winter is on its way and the craving for delicious, hot and comforting food has already started. 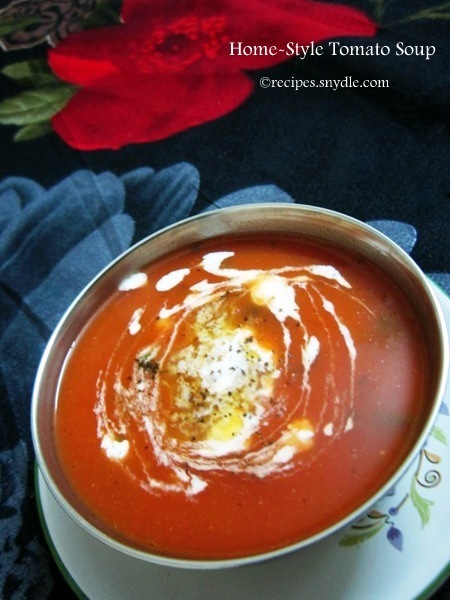 So why not begin with our winter food fiesta with hot and yummy tomato soup? Soups are so comforting, keeping us warm and full. Having a bowl of soup with our meals is a great way to cut back on unhealthy / empty calories. Not to mention how loaded they are with nutrients. 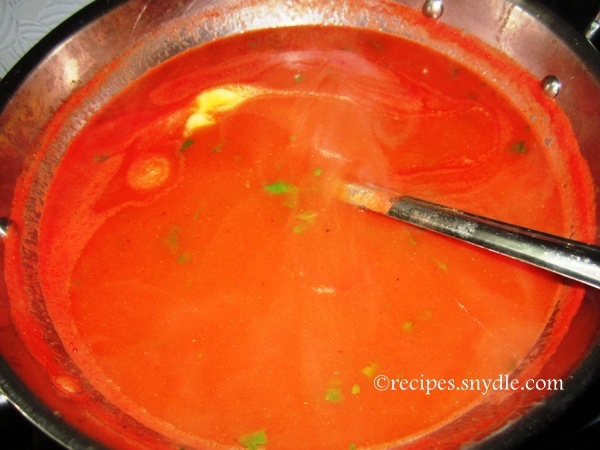 There are a couple of types of tomato soups which I make at home. 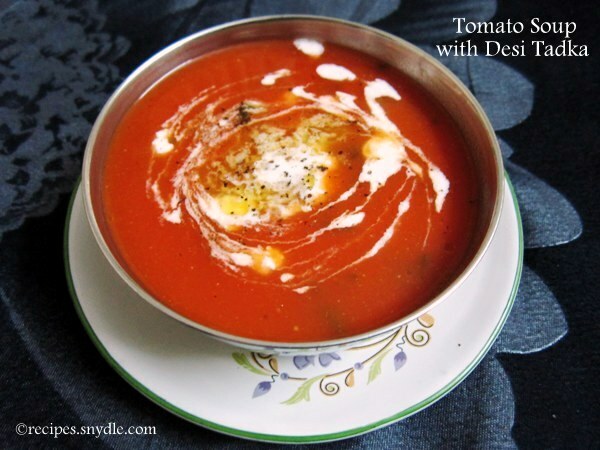 This one is the home-style tomato soup. It has a hint of Indian flavors that will make you feel at home every time you have this soup. The soup is tangy, loaded with flavors of cilantro and curry leaves. It gets its very subtle hotness from green chilies sautéed in butter. I have added some fresh cream and butter after serving the soup in soup bowls to make it look pretty and taste richer. 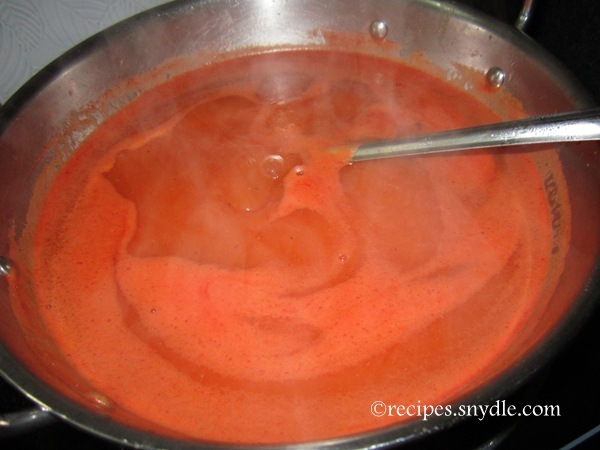 How to thicken a tomato soup? This is the age-old question bothering the newbies trying to make perfect tomato soup at home. Most people would simply suggest cornstarch. But adding cornstarch slurry in a soup that is made from scratch will not only malign its nutritional integrity but also undermine your efforts of making your meals healthier. Cornstarch is like a backfiring boomerang. Some people would suggest oats. Adding a handful of instant oats to your soup while it is boiling is a great idea. But it does hinder a bit with the taste. So the people out there, who don’t like oats in their soup, you can do what I did. Read ahead to know about this trick I used to thicken the soup. 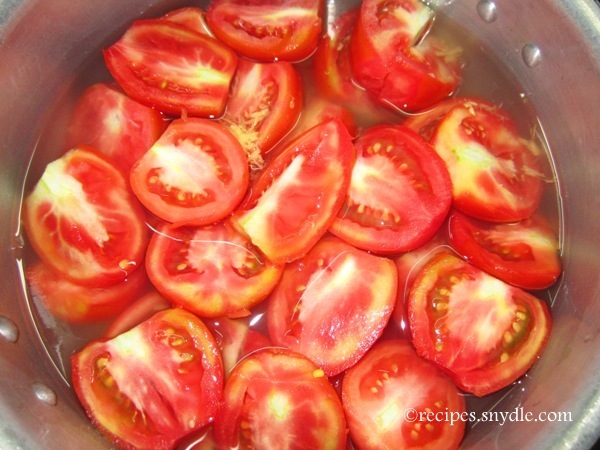 You should use ripe and red tomatoes to make soup, so that you get the right color and taste. You can add some fried bite-size pieces of bread in your soup. I like them in the restaurant-style tomato soup. I will share that recipe as well, very soon. This recipe yields 6 to 7 servings. For the purpose of measurement, 1 cup = 250 ml. I hope the step by step pictorials will help the novice out there. Let’s get started now. FYI, this is my Mom’s recipe. 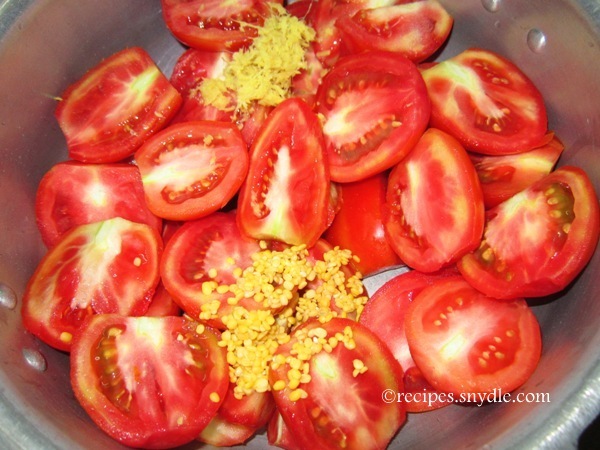 Wash and cut the tomatoes in halves or quarters. Place them in the pressure cooker. 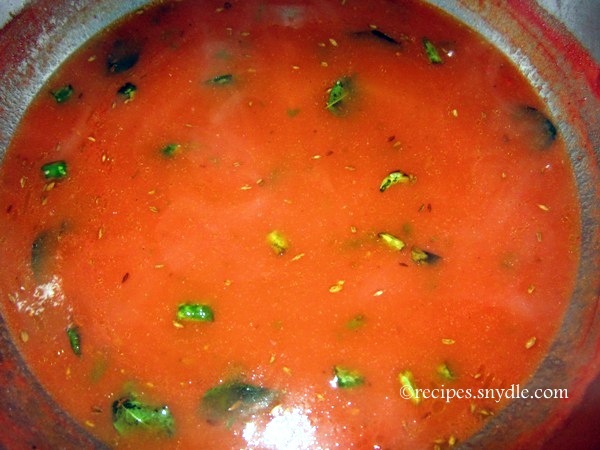 Wash the moong dal and add it to the tomatoes. Also add in the crushed ginger. Add water and pressure cook the tomatoes for 2 whistles. Alternatively, you can boil the tomatoes in a big saucepan covered with a lid. It will take a bit longer. Allow the pressure cooker to release the pressure on its own. You can open up the cooker and let the tomatoes cool faster. Strain the contents of the pressure cooker to obtain the tomato pulp and grains of moong dal. Reserve the stock . 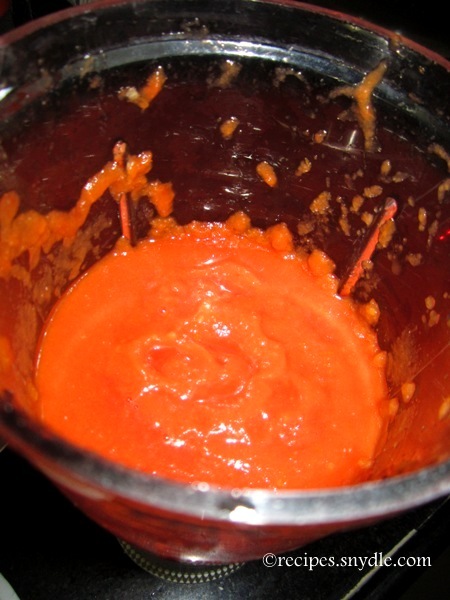 When the tomato pulp had cooled down enough, pulverize it in the mixie to a smooth paste. 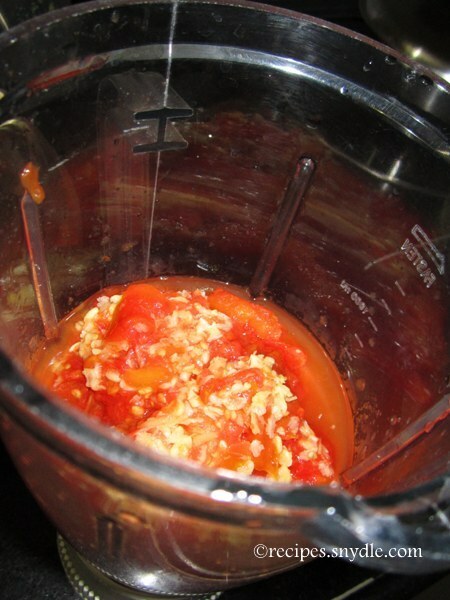 Add a ladle full of stock to the tomato pulp while grinding it, if need be. Now place a sieve in a kadhai or any pot you wish to cook the soup in. 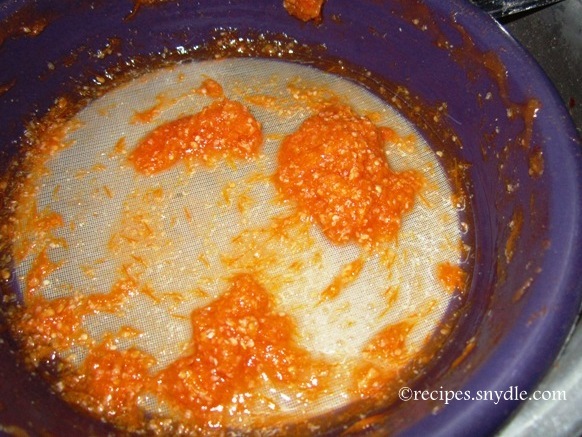 Strain the pulverized tomato pulp in 3-4 batches and add the tomato stock to it little by little as you do so. You have to use up all the stock . Now you have the strained pulp mixed with stock on one side and residue of the seeds and skin on the other. You can now discard the residue, since as you can see there is nothing left in it. Keep the kadhai/pot containing the soup on medium heat and stir it occasionally as it begins to warm up. Bring it to a boil. Add in salt and black pepper to taste. Add some sugar. Adjust the sugar according to your taste if you wish. We don’t need the soup to be very sweet. 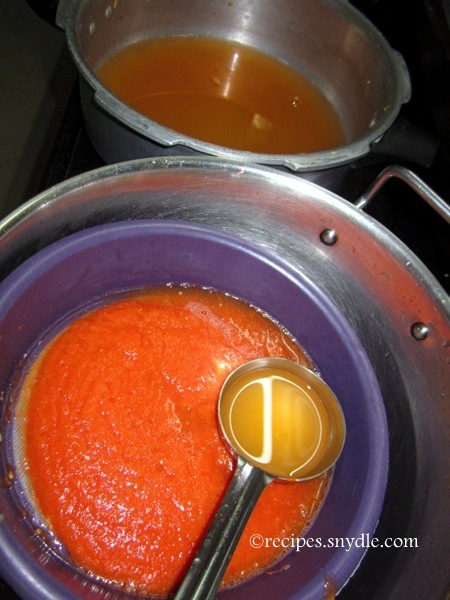 Sugar is used to neutralize the sourness from the tomatoes. The soup will thicken on its own from the moong dal it contains. 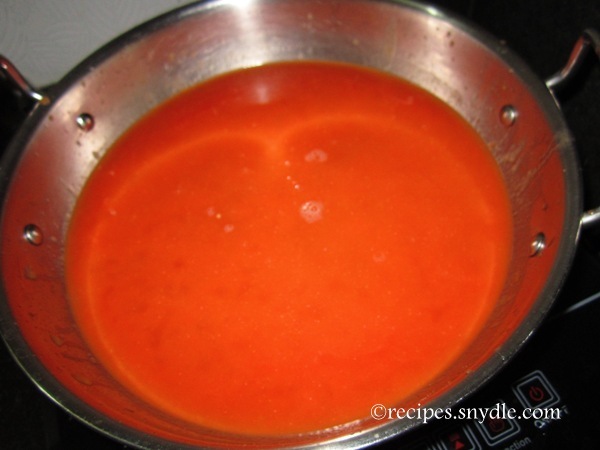 After 5 minutes of boiling the soup, add in the tomato ketchup. I used Kisan Tomato Ketchup. Try not to use the Hot and Sweet Ketchup, as it won’t yield the desired taste. Add in finely chopped cilantro / coriander leaves and a dollop of butter at this stage. Mix well. 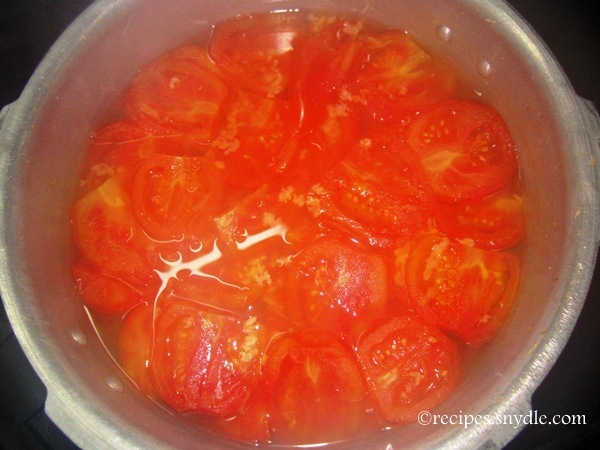 The raw taste of tomatoes will have vanished from all the pressure-cooking and boiling. Turn the flame off after a minute. Now it is time to prepare the tempering. Heat a pan on medium flame; add in the butter and oil. The oil will prevent the butter from getting burned. Turn the heat to low. Add in the green chilies and curry leaves. 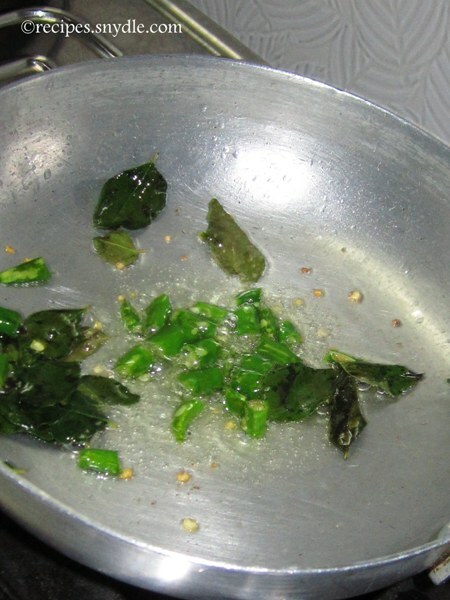 Sauté them till the green chilies turn golden and curry leaves become aromatic. Increase the heat and toss in the cumin seeds and let them crackle. Temper the soup with this tempering. Rich and creamy tomato soup is ready to be served. Serve it in the soup bowls. Add some more butter if you wish. Swirl in some fresh cream and drizzle it with a pinch of black pepper to make it look pretty. I used fork to make those swirls of cream. Enjoy your soup hot and give your body the much needed warmth.